Serve these pancakes with butter and syrup. Sift together flour, baking powder, and salt. In a separate bowl, combine egg and milk; add to flour mixture, stirring only until smooth. Blend in melted butter. Cook on a hot, greased griddle, using about 1/4 cup of batter for each pancake. Cook until brown on one side and around edge; turn and brown the other side. Recipe for pancakes serves 4. I take all the ingredients and mix-up with my hands and then put small amounts in the food processor and mix with short bursts. You can also use your hands and squeeze the mixture until it is mixed or use a potato masher. This freezes beautifully. Just put in serving size containers of form into patties. Heat 3 tablespoons of olive oil in a large stick-free frying pan on medium high heat. While the pan is heating, use a potato ricer much like you would a garlic press, and press out as much moisture as you can from the grated potatoes. If you don't have a ricer, you can use paper towels to absorb some of the moisture from the grated potatoes, but it doesn't work nearly as well. When the oil heats up to the point of shimmering, but not smoking, add the grated potatoes. Spread the potatoes out along the bottom of the pan. They should not be too thick in any one place, no more than 1/2 inch thick. Sprinkle some salt and pepper on the poatoes. After a few minutes, lift up one edge of the potatoes and see how done they are. When they have fried to a golden brown they are ready to flip. 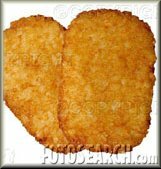 Use a large spatula to flip the potatoes over all at once, or divide the large potato cake into halves or quarters and flip. Again, when golden brown, they are ready to serve. Orange Juice, Coffee Orange Juice and Coffee ?? 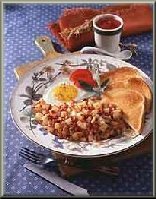 10 LOU SMIT: What did you have for breakfast? 11 JOHN RAMSEY: It might have been pancakes. 13 a special breakfast, but I don't remember exactly. 14 But we usually had a big breakfast. 17 of? I know I'm trying to get specific. 24 dinner, so we probably didn't even have lunch. 19 time? Did she eat the cracked crab? 3 sure she gets some. 4 TRIP DEMUTH: You remember that. 7 at their Christmas day dinner as an appetizer. 22 everybody kind of sat down to eat. 14 put them in the plate. 15 LOU SMIT: What were they? 20 JOHN RAMSEY: She doesn't take all of it. 23 MIKE KANE: They're real crab? 24 JOHN RAMSEY: Yeah. They're boiled like. 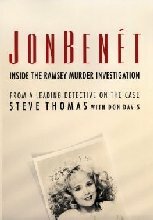 9 LOU SMIT: Did JonBenet like that? 11 but, yeah, she would have liked it. 13 apples, oranges or anything like tat? 14 JOHN RAMSEY: Not specifically. 25 JOHN RAMSEY: They usually had peanuts around. 2 that would have been very normal. 9 it. I might have two glasses. "The CBI had been able to identify two fingerprints found on a white bowl on the dining room table that contained uneaten pineapple. One print belonged to Burke and the other to Patsy"
"The police had to piece together the findings of the various pathologists, who had explained to them that when food is swallowed, it goes first to the stomach, then passes to the duodenum, and from there to the lower small intestine. Eventually, the digested food passes into the large bowel, from which it exits. 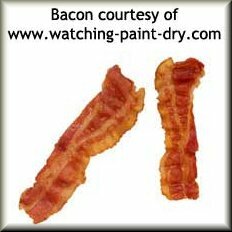 Food found in the stomach and intestines can sometimes be used to estimate the time of ingestion and to narrow the time of death. 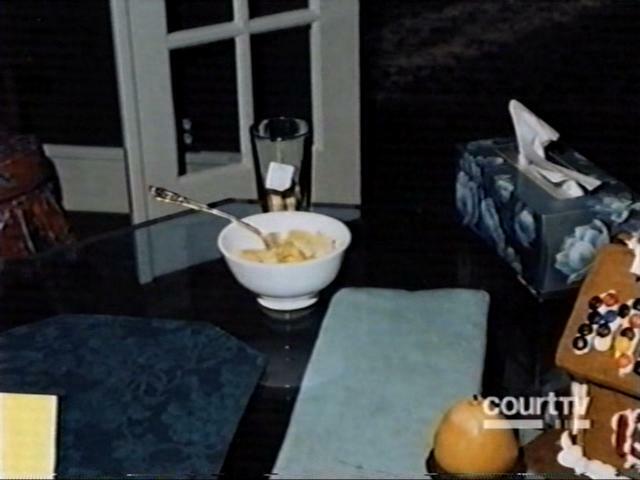 In the Ramseys' dining room, just steps away from the kitchen, the police had found a bowl with fresh pineapple in it. Meyer noted in his report that the pineapple in JonBen�t's small intestine was in near-perfect condition -- it had sharp edges and looked as if it had been recently eaten and poorly chewed. Based on the condition of the pineapple in her intestine, the experts estimated that JonBen�t had eaten it an hour and a half or two hours before she died, most likely after the family returned home that night. If she had eaten the pineapple after 10:30 P.M., that made the approximate time of death not earlier than midnight." "Returning to more serious subjects, Ramsey stumbled when Lou Smit questioned him about the pineapple. He insisted that he didn't remember JonBenet eating it at the Whites' Christmas party and knew she didn't eat it at home before going to sleep. 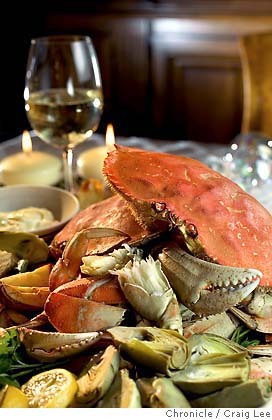 In retrospect, he thought it "strange" that Priscilla White fixed her a plate of cracked crab. He would "guarantee" JonBenet did not eat the pineapple at home, so it had to be before they went to the Whites' or while they were there. 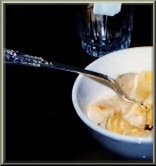 "I don't buy that an intruder fed her pineapple," he declared, adding that he recognized neither the bowl containing the fruit nor the spoon that were on the table. The very next day he retracted that firm statement, saying his lawyer chastised him for making it. Neither he nor Patsy fed her pineapple, he said, but then he asked, "What if she knew the intruder?" After thinking about it, he said, "It hit me like a ton of bricks." JonBenet "adored" Santa Bill McReynolds, and if he had come into her room, she would have gotten out of bed and gone downstairs with him without a problem. "She may have had a secretly prearranged meeting," he said. "Maybe he fed her pineapple." 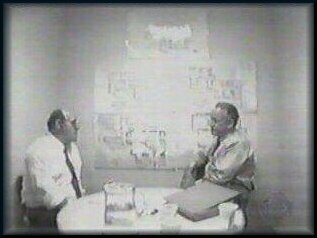 The detectives stopped the tape and watched that section repeatedly. Only the day before, Ramsey had said such a thing was impossible. Now he laid it on Santa Bill." 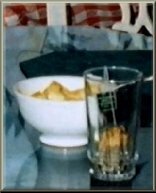 "Kept from the public until now is the fact that a glass containing a tea bag was photographed next to the bowl of pineapple. How did it get there? 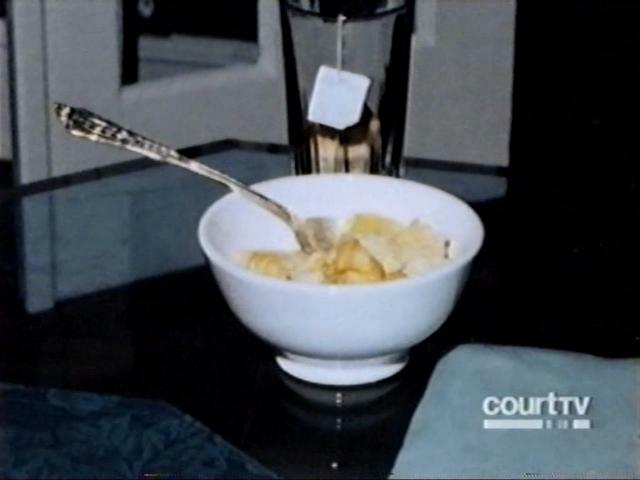 And was the tea and the pineapple consummed at the same time?" Patsy: But I did not do this. If she ate that, somebody put that there. 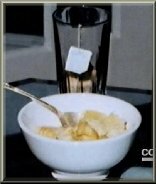 Patsy: I can never recall putting a tea bag like that, in a cup. Okay. Patsy: So I don't know, what the answer is. 18 TOM HANEY: Iced tea? 19 PATSY RAMSEY: Iced tea. 22 PATSY RAMSEY: Mostly in the summer. 4 and the tea bag, how those got to be there? 8 to a pitcher and add the sugar. (Inaudible). 9 TOM HANEY: How about that particular glass? 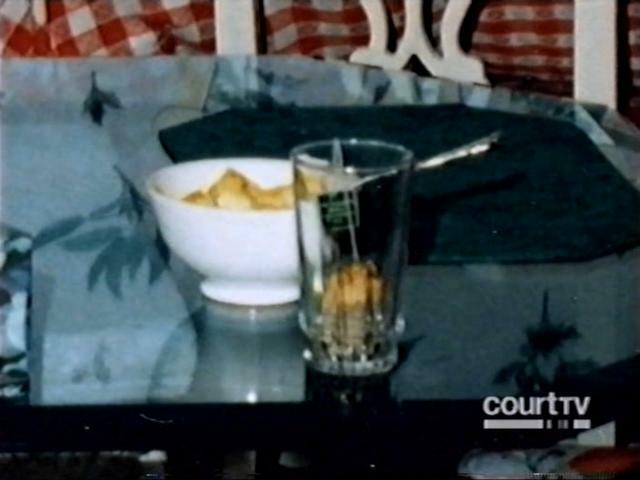 10 PATSY RAMSEY: That is a water glass.